The MidMop MMT 1616 from Numatic is an innovative mopping system that comes with a full range of accessories. Its compact design makes it easy to transport along with its twin buckets. The MidMop has been ergonomically designed so that the operator does not have to continuously bend down. The mop press is mounted in the middle and above the clean and dirty water buckets, which gives the operator full access to both buckets all the time. 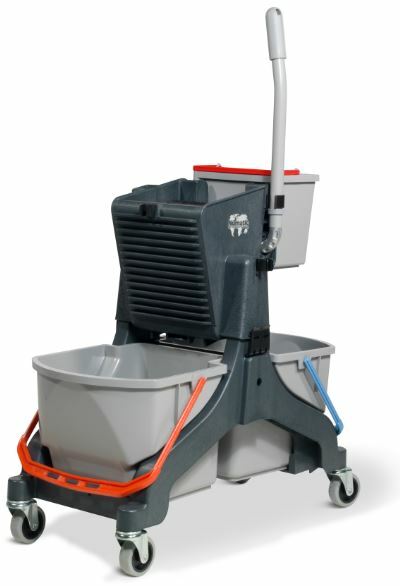 These two 16-litre buckets can be removed and replaced without moving the mop press. The mopping system ensures a good and efficient mop-rinsing facility through the integrated water diverter that moves dirty water into the red handled dirty water bucket. The blue handled clean water bucket is then used for high quality cleaning. If your client needs a cleaning and maintenance solution, recommend the MidMop. This system can be used with both Kentucky style and flat mops and the range of accessories allows clients to create a unit to fit their needs and environment. For more information, contact Numatic on +27 (86) 168 6284 or via www.numatic.co.za. If you enjoyed this article please join other discussions like these on https://www.linkedin.com/showcase/10172797/, http://www.facebook.com/buildinganddecor and http://www.twitter.com/buildingdecor, and sign up for our newsletter: http://www.buildinganddecor.co.za/register/.